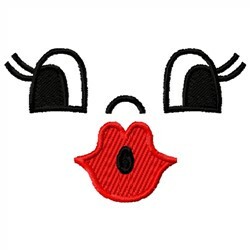 This kissy doll face is great on home decor in a little girl's bedroom. Add to wall hangings, cushions, and even apparel. Embroidery Stitches is happy to present doll face machine embroidery design which has 4716 stitches and is [89.15 mm x 57.15 mm] large. If you would like to view more embroidery patterns please search on our embroidery designs page.